It’s winter down here in Australia. It’s meant to be freezing. Here at the farm I have a wheelbarrow of hardwood at the back door, waiting to be fed into the fireplace. I have my warmest beanie and scarf, my big coat and my woolliest socks all sitting on my dresser. None of them are needed. Right now we’re having an unusual weather event. Warm air from the Coral Sea is being pushed down Australia’s East Coast, giving us balmy temperatures and gentle rains. It is supposed to be dry right now. It is supposed to be COLD. I, for one, am not complaining. It is a strange but wonderful sensation to feel the kiss of balmy air upon your cheek mid-winter. 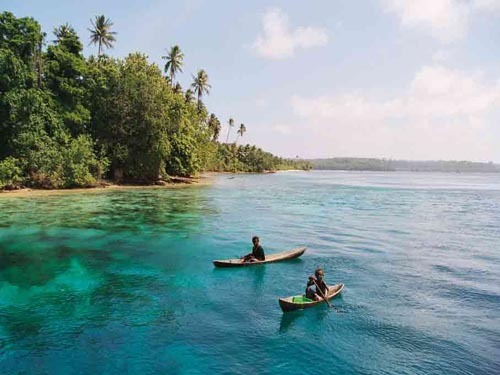 And it makes me happy in another way… This air has recently been in the Solomon Islands. It feels like a magical bridge somehow. It gets me thinking of my friends Mike and Gracie, and their Island home on Gizo, where Ben and I were married many years ago. It brings to mind many happy adventures in the Pacific, and it makes my heart yearn for a little tropical flavour in my life. 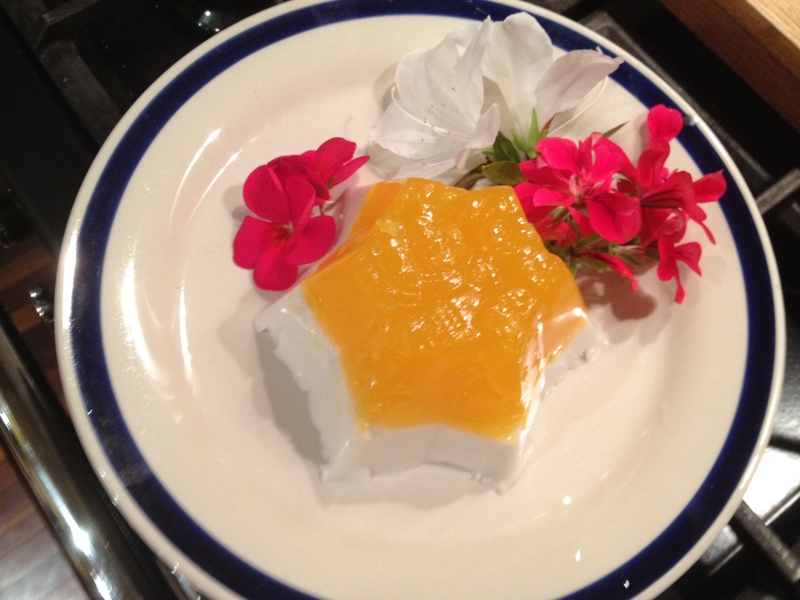 The best I can come up with at short notice is home-made Mandarin and Coconut Jelly. This is a delicious sweet – the mandarin layer is light and tangy, the coconut layer creamy and rich. It speaks to me of summer, but in winter it is the perfect dessert after a spicy curry. This recipe will make approximately four cups of jelly. You can make it in one bowl, or several smaller moulds. This jelly is strong enough to be unmoulded and served on a plate. It is also useful made in a long tray and sliced into cubes or ribbons to serve a larger crowd. Make sure to wet or lightly grease your moulds to help the jelly slide out easily when it is set. 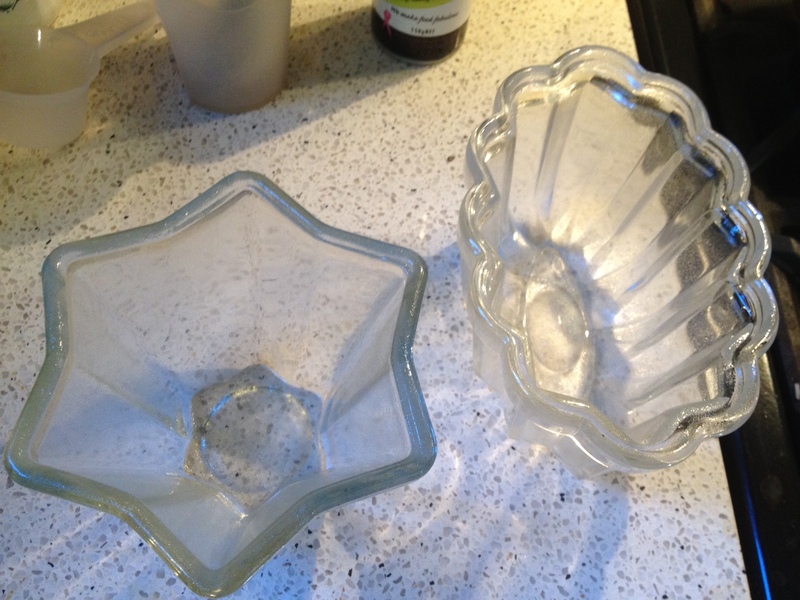 Two of my favourite antique jelly moulds – aren’t they sweet! 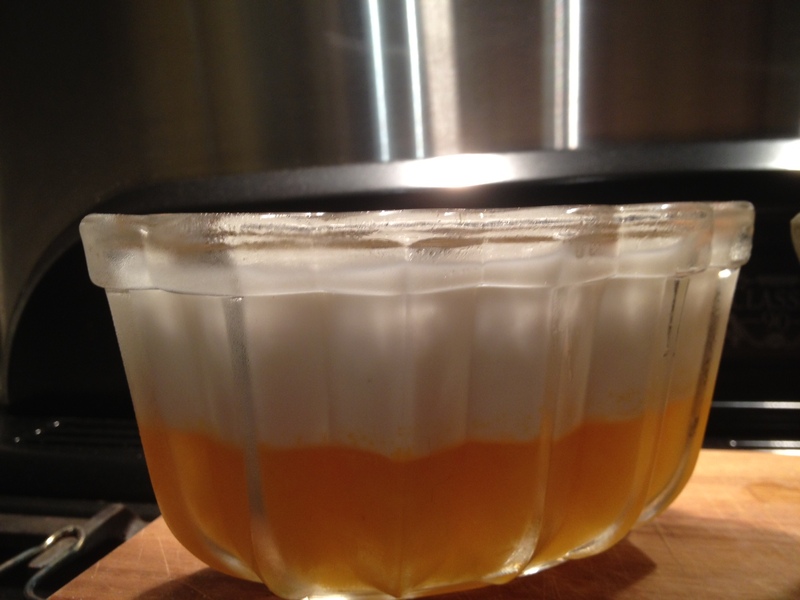 1 cup of fresh mandarin juice, 1/2 cup of water, 1/4 to 1/2 cup of sugar, 1 and 1/2 teaspoons gelatin. Put the gelatin in a bowl with the water or Malibu and let it swell. Place the coconut milk in a saucepan with the sugar, heat and stir until the sugar has dissolved. Take off the heat. Now add in the gelatin mixture and stir until dissolved. Allow to cool on bench while the mandarin jelly is setting. Once the first layer is firm, gently pour on top and return to fridge to set. To serve, unmould onto a plate. This is lovely with passionfruit, or sliced fresh seasonal fruits. Also good with ice-cream or sorbet. If you can, try it with mango sorbet, or macadamia nut ice-cream. Or both. Heaven in a bowl. This is so seriously easy, and so visually impressive – plus it packs a wallop of flavour. I hope you try it. Enjoy! 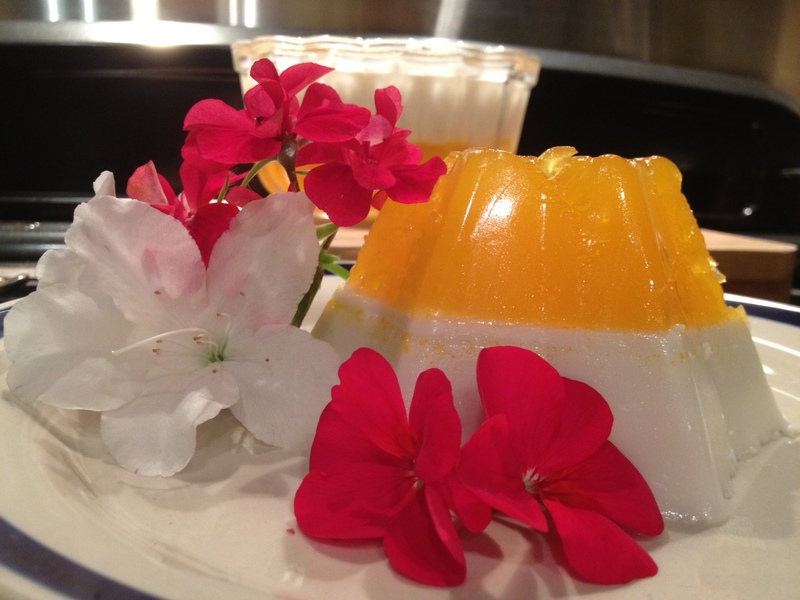 This entry was posted in Cakes and desserts, Gluten-free and tagged Coconut jelly recipe, dessert, easy cooking, easy dessert recipe, food, Gizo, gluten-free dessert, Mandarin jelly recipe, solomon islands by Cauldrons and Cupcakes. Bookmark the permalink. Cold here now too, so maybe your nice warm weather has returned! We are dying in New York. It’s been very hot and very, very humid. Going outside is awful. It was supposed to rain last night to take some of the moisture out of the air. But did it rain? No. But there was a lot of lightning and thunder! But not a drop. It was a horrible tease! 🙁 I heard it’s been pretty horrid over there. Commiserations. And yes, the jelly was so good we completely demolished it… Ooops. I love the flowers too! So pretty! I wouldn’t put those on my head; I would smell them! I saw vegetarian gelatine in the supermarket the other day. I can’t remember the name of it now but it caught my eye at the time. I’ve never made jelly from scratch like this, I think I’d be a bit nervous trying to make it but I’d like to try, especially the coconut one, that sounds wonderful. Your photos are very compelling! Enjoy your Indian summer, and if you’ve got any heat going spare you could post it over here. I was out yesterday, in what is apparently the middle of the British summer, thinking how remiss I had been not to don a woolly hat and scarf. Oooh, baby–pass a plate and bring on the tropical breezes! so it will be perfect..
Thanks…and enjoy the mediterranian tropical breezes while you can! Sounds delicious – two of my favourite ingredients. I have a mandarin tree and made delicious marmalade (after fighting off all the stinkbugs. Wrote about it on my blog). I think I’ll try putting some marmalade in this recipe. Hope it works. Will do. Need to purchase one of those cute jelly moulds first.